1) The first two products are from Kiehls Creme de Corps line. One is the Creme de Corps Soy Milk and Honey Body Polish (6.8 oz, $29), which is an amazing body scrub that has fine granules that help remove dry skin. The smell of this polish is amazing- it literally makes you want to eat it! It’s a sweet, but not overpowering scent that is reminiscent of an orange creamsicle, or a smoothie. Now, I have really sensitive skin and am rather picky about what scrubs I use on my body. This scrub, however, is strong enough to wash away all the dry skin but gentle enough not to leave my skin irritated afterwards. Plus it doesn’t leave any oily residue, like most washes do! 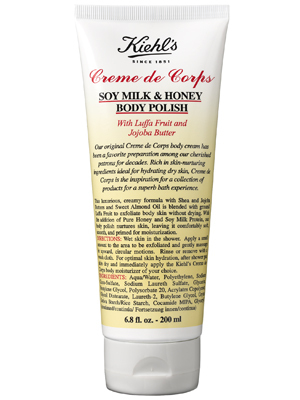 2) After using the polish, you’ll want to complete your routine with Kiehls Creme de Corps Soy Milk and Honey Whipped Body Butter (8.0 oz, $36). The Body Butter smells just as amazing as the scrub- and leaves your skin outrageously soft! While both of these products are a bit pricey, they’re worth their wait in gold- plus you only need a little to get the desired effect, which means they’ll last for ages! Buy them online here, or pick them up in store. 3) Kiehls Amino Acid Shampoo (16.9 oz, $28)- I love the amino acid shampoo and conditioner together because they leave your hair feeling like it was cleaned, but it wasn’t stripped of all it’s nutrients. It’s definitely a gentle cleanser that doesn’t make your hair feel weighed down in the least. Now, I’m a Pantene sort of girl but I was so surprised by how much I love this product that I don’t mind that this doesn’t really have a scent. These two have definitely made my Spring Favorites list for sure! 4) Kiehls Amino Acid Conditioner (16.9 oz, $30)- see above. 5) real Techniques Core Collection Set ($17.99 on Amazon)- I realize that these brushes sound pretty expensive, but if you’re somebody who works in photography, weddings, beauty, or the make-up business then you don’t need me to tell you how invaluable a good set of brushes are. And if you’re somebody like me- a girl who loves to do her own makeup and practically choked up my .99 cent Arizona up on the Sephora saleslady when she told me a sephora foundation brush was $34- then you’ll love the steal that these brushes are! 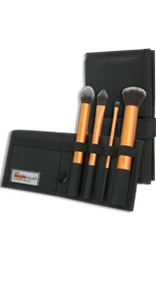 Designed with super famous pro makeup artist Sam Chapman real techniques brushes are made with taklon bristles- which means they’re ultra plush and super smooth- which is great for your skin and applying makeup! Plus each brush is HAND CUT- so they’re the perfect shape! Check out their site here or buy them on amazon here! 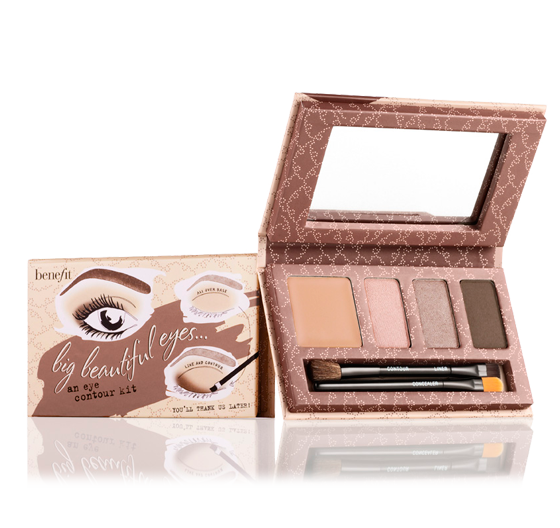 6) Big Beautiful Eyes Contour Kit ($32 from benefit.com)- I love this kit SO much! It makes it super convenient to put on eye makeup in a hurry (because, as a perpetually late person, I am always in a hurry). Follow the simple steps in the little booklet inside the kit, and using the included mirror and brushes, you’ll have your eyes looking bee-yoo-ti-full in seconds! Benefit’s makeup is of such great quality that you don’t have to pile it on to get the look you’re going for- and it lasts quite a long time. 7) Super Shock Mascara ($5-9 on avon.com)- When I’m not wearing BADgal lash mascara I go for this one. It’s highly recommended and leaves you looking like the snaffaluffagus from Sesame Street. in a good way. 8) e.l.f. Essentials Waterproof Eyeliner Pen ($1 on eyeslipsface.com)- I really love the look that liquid eyeliner gives- that smooth flawless finish. However, unless you’ve got a super steady hand and can eyeball when there is too much liquid on your brush then you’ve probably experienced the awful sting that accompanies eyeliner dripping into your eye. I kid you not, I have turned the whites of my eyes a beautiful shade of Indigo Blue no.9 whilst trying to line the lower lids. But this pen is not only super affordable, but it leaves you with that same smooth dramatic finish without irritating your eyes, and no flaking (as some liners tend to do). 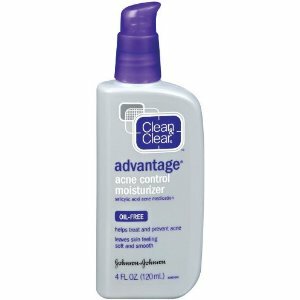 9) Clean & Clear Advantage Acne Control Moisturizer ($3-5, at your local drugstore)- As I’ve probably mentioned before, I’ve got acne prone combination skin. So naturally I’m always on the hunt for “the perfect product” something that’ll take care of dryness, oiliness, acne, reddness, spots, and dark circles all at the same time- and has the added benefit, makes my face look like that of Kate Winslet. I haven’t found it yet but in the interim Clean & Clear’s Acne Control Moisturizer helps make my face appear flawless when applied stealthily under my foundation. It takes care of my acne, and shine, and redness, while moisturizing the dry parts of my face. What products do you use? What can’t you live without? Is there a product that is a permanent fixture in your beauty bag?